Welcome to our first edition of the Brunswick Real Estate News! Brunswick is a community we love and are wholeheartedly committed to. We are excited to present you with our first edition of the Brunswick Real Estate News. We've published a ton of great information about Brunswick, homeownership, finance, and more. 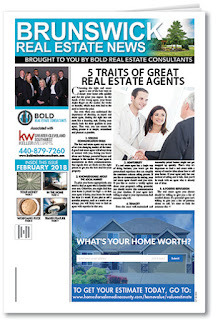 On the cover, we discuss 5 traits of great real estate agents. You can also read about whether or not it is a good idea to invest with friends or family after retirement. Look to page 2 to find out about some great brunch spots in the Brunswick area. In addition, you'll also find some great travel and decorating articles, as well as a delicious recipe from Wolfgang Puck. We hope you enjoy reading our paper as much as we've enjoyed publishing it. Let us know your thoughts, and don't forget to check out our listings on the back page! Grab a cup of coffee and have at it. Thanks, Brunswick!